It’s almost time for us to head home and indulge in too much food, copious amounts of drink and treat ourselves to multiple repeats of the Die Hard trilogy quadrilogy. Apart from it being a fantastic product, when coming to designing the site, we were given the chance to do something a little different. We experimented with textures to create a scrapbook style feel to the site which has worked really well in bringing the essence of the product across. It also helped that the brand, created by Projector, was gorgeous and this transferred to the web easily. Overall, a great website to design. 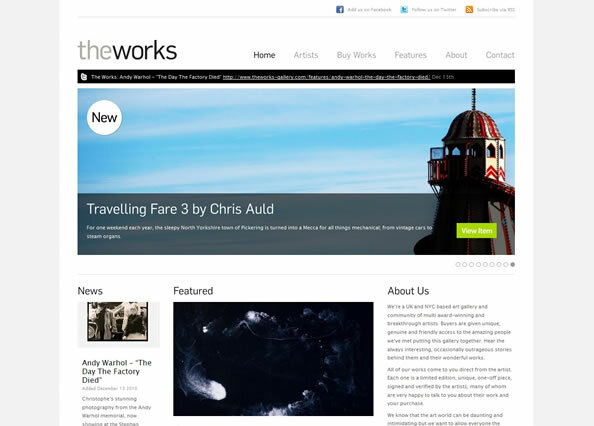 The build of The Works Gallery was interesting because we put a lot of effort into the use of social media on the site. We implemented a scheduled feed query to pull in Twitter posts from The Works’ own account and also tweets from the various artists’ accounts. We also integrated both ‘Like’ buttons from Facebook and ‘Tweet’ buttons from Twitter to allow visitors to share anything on the site that they particularly liked with their personal contacts. Another interesting aspect of the site was the use of a dynamic image resizing script to generate the various thumbnails and featured images. This is all integrated with the custom CMS to allow the client full control over where and how the work is displayed on the site. One of the major challenges on the site was creating galleries that integrated videos as well as images to be displayed in a way that was neat, easy to navigate and fully controlled by the client through the cms. We did this using as combination of our own custom video player, image resizing script and the jQuery cycle plugin. 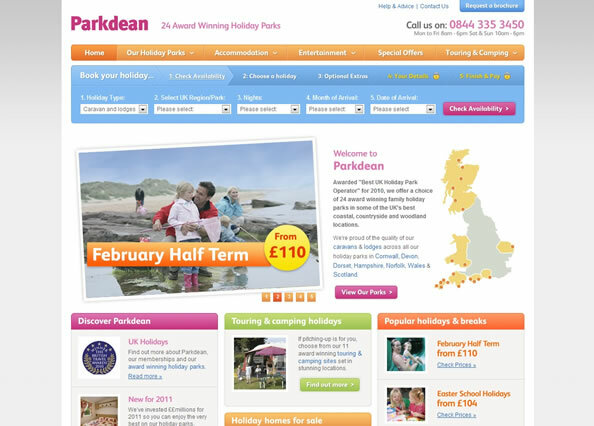 The new Parkdean website only went live in mid-December, so it just squeezes into 2010. It’s my favourite project of the year for a number of reasons, the main one being the sheer amount of work that went into the research, planning and preparation of the site since we started work in the summer. A lot of people don’t see a lot of value in investing in the planning stage of a website project, but in my opinion the final product really benefits from a thorough initial process. Every element of the site was discussed, sketched out, tweaked and designed. For that reason, my favourite website of the year has to be Parkdean Holidays. My favourite project is probably PXA Express’ online booking system. It’s really a one-of-a-kind system, built completely from the ground up. Complex interacting databases for both the administration and client system. Cool interactive ajax calendars for filtering consignments. Extremely effective usability for both administration and clients. Holds a lot of responsibility in regards to the actually business, improving efficiency by at least 70%. Unfortunately we cant display the admin panel part of the website, but we’ll be working on their brand new website next year so hopefully that’s as impressive as the parts we cant show! From a design point of view, I’d have to say Bespoke Radio is my favourite. I love the colour scheme, the curly fonts used, and I think its different than your average radio website. Its got a softer feel and quite feminine; a lot of other radio sites have too much going on! 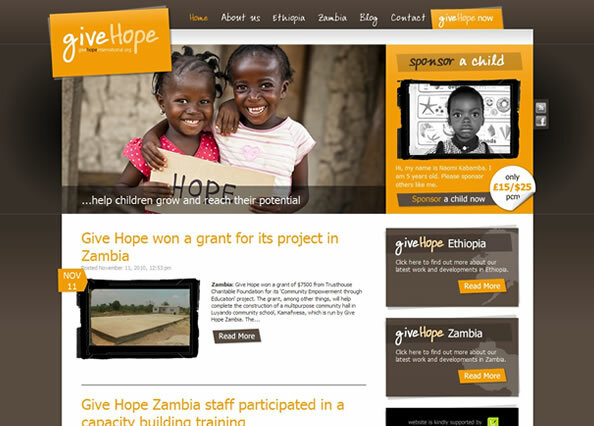 My favourite of the year would have to be the Give Hope site. They are a UK-registered charity, helping communities around the world, predominantly children in Africa. We gave up our time to help out this fantastic and worthwhile charity. Are efforts are in no way comparable to that of the Give Hope teams efforts in Eithiopia and Zambia, but we could at least provide a great looking and functional platform from which they can promote themselves to the rest of the World. I look forward to working with Give Hope in the future to help grow them to the status they so greatly deserves.